VeeR is one of the largest and fastest growing global virtual reality video platforms. We aim to provide the best VR viewing experiences for our audiences. The VeeR Cardboard is specifically designed for smartphones. With this VR cardboard, you can easily enjoy virtual reality, anywhere and anytime in the world! VeeR VR Cardboard Glasses are compatible with most VR video apps. ✔ Amazing VR Experience - This quality VR viewer is perfect choice for people who new to VR. Enjoy the exciting VR games and videos at a affordable price. ✔ Lasting Material - The cardboard is made from AAA grade waterproof corrugated paper that is sweat-resilient and enduring. ✔ Design For Comfort - Providing protective sponge, nose and forehead pad for maximum comfort. Light body reduce the pressure to your head, giving you immersive VR experience. ✔ Plug n' play - Simply plug your phone into the headset and hit the play button to enjoy a wide range of VR films from VeeR or other Apps. 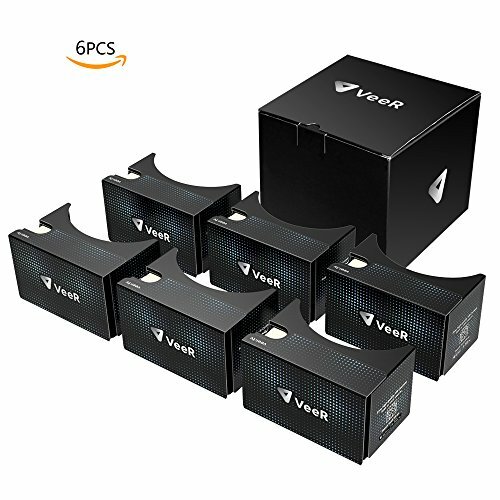 ✔ Well Packaged - Each box contains 6 indivdual small packages for VeeR cardboards. All the accessories included in the small packages. Easy to carry, perfect gift for family and friend!